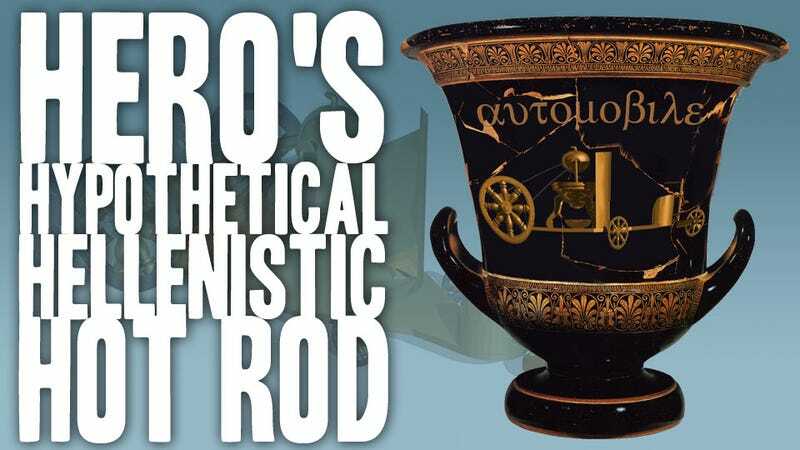 The Greeks Had The Technology To Build A Car in 60 A.D.
Mercedes-Benz likes to pretend they invented the automobile, but that's a well-engineered, luxurious load of crap. The roots of the automobile go much further back, and researching how far back got me thinking. If we ignore, gleefully, what actually happened, when could the first car have been created, at least technically? How's 60 A.D. — the middle of the Roman Empire — sound? The earliest reference to any sort of self-propelled motorized machine that I've seen is from 1672, when Ferdinand Verbiest, a Flemish missionary living and working in China, built a small, steam-turbine-powered model car, likely as a toy to amuse the Chinese Emperor. It's not even sure it was built, and even if it was, it's far too small for a person to ride in, so it doesn't really count. While figuring this out, I started some drawings, but then went a little bonkers and dragged out my archaic 3D software, and made an actual 3D model, so I could really see how this thing would look. It's a bit crude, I know, (and, if I don't my kindly commenters are usually delighted to point stuff like that out for me) but I think it'll give us a good idea of what I'm describing. After some research, I think the best candidates to have built this hypothetical first car are the ancient Greeks, specifically one ancient Greek, Hero (or Heron) of Alexandria. Hero was about as close to the ancient world's Tesla or Edison as you could get; he invented the vending machine, the first wind-powered machines, the syringe, force pump, early work in automation, and, the most important one for my purposes, the first steam engine, called an aeolipile. You may have seen an image of an aeolipile around (McSweeney's uses a little drawing of one as their logo), as it's distinctive looking: a sphere, with two nozzles, one at each end, pointing in opposite directions, mounted on two pipes, which lead to an enclosed, water-filled boiler over a heat source. The way it worked was pretty simple: water, heated in the boiler, would form steam, which would fill the sphere and then exit via the opposite-facing pipes, spinning the sphere thanks to the action/reaction law. What it really is is a very primitive rocket— a reaction motor. It's not very efficient, especially at the sort of pressures the Greeks were able to make one withstand, though it should be capable of performing actual work. Hero himself only really thought of it as a toy, though it is believed it was used to open automatic doors in a temple. There's some debate over just how much it could actually do, but in mideval times versions of it were used to turn cooking spits, and, really, there's no reason it couldn't have been employed to do work. Which is good, because it's the engine of my hypothetical first car. To make a Hero engine put out enough power to be useful, I think two things would need to be done: it would need to be scaled up to a good size, and the output geared down dramatically to turn the high rotational speed into useful torque. Hero knew about gearing and gear ratios, and employed them in many of his machines. In this example, I'm gearing via belts and pulleys, to keep weight down a bit and to accommodate the somewhat awkward structure of the vehicle. The spinning sphere has power taken off from small-diameter pulleys built into the bronze shell of the sphere, near the pivot/steam entry pipes, and that power is taken by belt to a much larger diameter set of pulleys mounted on the axle. This arrangement would translate speed of rotation of the sphere to torque at the axle, much like first gear on a car. I don't think a changeable transmission would have been likely, so this is a one-speed vehicle, and that one speed would probably have been little better than a walking pace. Which is my excuse as to why I didn't design any brakes or throttle in this. The chassis is very simple, and based on the Greek's existing chariot-making skills of the time, just enlarged. That means no real suspension, since they didn't seem to use any on their chariots. It would likely be built out of a combination of bronze, wood, and some iron for axles and other hard-wearing elements. The bodywork is limited to a chariot-like front cowl, and a large steam-shield in the middle, separating the driver and fire-tender from the spinning, steam-spewing monster directly behind them. A hole is provided in the steam-shield to give the fire tender access to the fire, and to provide a way to feed in more fuel. The vehicle uses a five-wheel layout for several reasons: I originally planned a three-wheel layout, to keep the steering mechanism as simple as possible (it's based on a simple hinge, which they'd easily have understood and been able to produce), but when the overall length of the beast became clear, I realized another set of smaller wheels would be needed to support the weight of the automobile in the middle. It's also worth mentioning that this thing would likely have been a loud, scalding hot, and overall terrifying thing to see in action, which I regard as a plus. I think this vehicle design would have been within the grasp of the ancient Greeks, and I do think it would have worked, in some limited way. It would't have been easy for them to build, but I think a culture capable of building the Acropolis could have pulled it off, had there been any interest. It likely would have been used in a processional context, for religious or political parades, I'd imagine. But who knows? If the Greeks had actually built something like this in 60 AD/CE, then imagine how much further along we'd have been transportation-wise. This would have likely led to developments that would become something like steam trains, and I can't imagine anything the Roman Empire would have loved more than a railroad network. If we had railroads back in 500 AD/CE, what would we have now? Hovercars? Jetpacks? Rocket pants? I'm a big dork when it comes to this kind of alternate-history thinking, so you'll forgive the length and embarrassing enthusiasm of this post. What's important now is convincing the guys at Mythbusters to build this thing and try it out. Anyone have a connection to those guys?